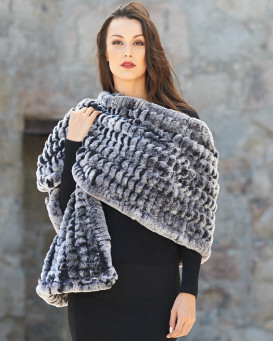 With fur shawls, you can feel just as warm and comfortable while out and about as you do when wrapped in your favorite blanket and sitting on your living room couch. The newest fur wraps and shawls incorporate luxurious elements like rabbit fur, mink fur and real cashmere that drape you in a softness you can't imagine until you put on one. Though some designs and styles are perfect for everyday wear, others are better for special occasions. Shop for fur shawls for weddings and special events or for cashmere caps that add a special touch to any winter outfit. "Fabulous to wear for the extra warmth, the wool makes it snug and the fur adds the extra layer of cosiness around your neck. Lightweight, perfect for travelling, packs easy and goes with anything. Warmer than I thought, which is great. It is exactly how it is shown. FurHatworld have great prices, great products and prompt delivery. I would not hesitate to recommend them, and their products." "Just as advertised. Very beautiful." "The shawl is perfect! It is just as shown on the website. I came across the website and quite frankly didn't know what to expect. I was pleasantly surprised with the great service. I also ordered a fur trimmed sweater that is wonderful. Last month I was in So Korea and shopped the fur market there. The prices furhatworld has are very competitive and in some cases even better. I will be making additional purchases in the future." "I love the shawl. I have been looking for a shawl for my daughters wedding and finally found the perfect, sooo soft, beautifully made, and I love the color of this fur shawl! Perfect price too! Arrived quickly also. Thank You FurHatWorld"
"So soft, so warm, so beautiful. so lux!! Color is gorgeous. Lots of compliments! I also got the Rex rabbit bucket hat to match. Love them both. Bonus - quick shipping and reasonable price. Buy from FurHatWorld with confidence."